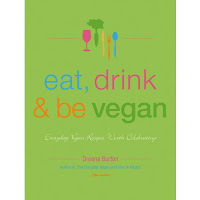 I borrowed Eat, Drink and Be Vegan by Dreena Burton from the library to give it a shot before I committed to purchasing it. I've been a follower of Dreena's blog for awhile and her recipes always appealed to me. I like that recipes were labelled "wheat free" when applicable and many substitution ideas were given. I've found a lot of great recipe ideas in vegan cookbooks since the beginnings of my elimination diet and this one has been no exception. I only wish that the cookbook had more pictures and that the nutritional information had been included. Other than that, it's love. I've asked Joey to buy it for my birthday and I'm looking forward to have a copy to call my own! !